Taking a tripod with you when you travel isn't always that convenient. Some of them can be big, heavy, and cumbersome. But thanks to the combination of affordable carbon fiber and an innovation by Gitzo several years ago that has been copied by many other tripod manufacturers, today's travel tripods can be very sturdy yet very light and fold up into a surprisingly small package. It's led to the new generation of travel tripods, which has become quite a crowded market. The one I'm looking at here is a new model from 3 Legged Thing, a small British company that focuses on travel tripods. I've reviewed some of their other tripods before. All of their models have boys' names. and this one continues that tradition—it's the Leo. The Leo is the smallest in the Equinox series. Like the others in the series, it's made of carbon fiber, uses twist locks for its leg and center column extensions. And they all share a new, distinctive color scheme that stands out next to most other boring black tripods, with bulging bronzed twist locks that somehow remind me of furry leg warmers. It folds up into a small travel-sized package but still manages to boast an unusually high load capacity. The legs have a manual ratchet lock at the top that can lock them in one of three shooting angles: 23°, 55°, and 80°. The ratchet lock at the top of each leg is manual, not spring-loaded. There's a bubble level on the legs and another on the ballhead. The traditional tripod stance has the legs at a 23° angle. That gives you the maximum potential height, but the narrower footprint also means that the center of gravity is more critical. You can broaden it to a mid-level 55° angle. And for low-level shooting you can remove the long center column and splay the legs wide at 80°. That way, you'll get a lot of stability and a low vantage point just a few inches off the ground. With five sections that can extended, the Leo gives a maximum shooting height of 51.5 in (131.1 cm) or can go down to near ground level less than 5 inches off the ground. The feet are detachable, so if you want to swap the default rubber ones our for steel spikes, you can. You can also replace the rubber feet if they become damaged. The feet are detachable and just screw out. One of the distinctive things about several of the 3 Legged Thing tripods is that they add more extension sections to the center column. In this one, there are two, each with a twist lock. Monopod. And as with some other travel tripods, you can also use it as a monopod. The central column comes out, and one of the legs unscrews. Connect them together, and you end up with a monopod. You can use it with or without the ballhead—just screw the head clamp in directly if you want to use it without the ballhead. The Leo is available bundled with either the lightweight AirHed Switch ballhead or the heavier-duty AirHed 360 ballhead which is both more robust and adds better pano rotation. Another option is to just the legs alone and attach another head of your choice. The AirHed Light ballhead is pretty straightforward and compact, but it's also very strong. The one I used--and the one pictured in these shots--is the AirHed Light. There's a similar version with a lever-style locking mechanism, the AirHed Light. It's compact but very strong, with a load capacity of up to 88 lbs (40 kg). It uses a single large knob to clamp down on the ball. A single large knob controls the clamp on the ball. 3-Legged Thing products have always been designed to work well with Peak Design products. The Airhed ballheads are fully compatible with the Peak Design QR plates, which are themselves designed to be Arca-style compatible. It comes with a canvas case and shoulder strap. Another tripod in the Equinox series is known as the Albert. It's much taller and a little longer when folded. I'll be posting a review on it soon, but in the meantime here are some side-by-side photos. At left is the is the Albert. At right is the Leo. I've found all of the 3 Legged Thing tripods I've used to be well-made and thoughtfully put together. Once again, 3 Legged Thing has gone for distinctive styling, which comes down to a matter of personal taste. Without the center column extended, the legs provide good stability for a DSLR or mirrorless setup, with the usual qualification that a small, light tripod like this simply doesn't provide the same rock-solid base as a big, heavy tripod beast. Extended the center column increases the likelihood of movement with the shutter or in the breeze, something that will be more pronounced the heavier the load. A big feature of the Leo is that it has an unusually high load capacity. 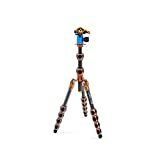 The rating is at its highest when the tripod is in its most upright stance and reduces significantly when the legs are splayed wide, but its maximum load capacity of 66 pounds is significantly higher than many other tripods. Folded, it compacts down to a size in a similar range to several of its competitors. Fully extended it comes in on the short side of many of its competitors—with a maximum height of a little under 52 inches--so it's not going to be a good choice if you're tall and hoping to shoot at eye level. Overall, I've found the Leo to be a good, portable travel tripod, but overall it's on a par with several other tripods on the market. Find Them At . . . There are several buying options: legs alone, bundled with one of 3 Legged Thing's ballheads, and a choice of two QR bracket styles. So make sure you're getting the specific combination you're after. It can be found at B&H Photo and Amazon. I got a 3LT Leo with the Airhed LIght last year and only use it on long distance trips where I fly (I just throw it in my suitcase). Overall, I am happy with the tripod even though I have to bend over a bit to take photos (I am tall). I would suggest if you are tall, get the Albert. The huge problem I had was with the Airhed Light. I only used the tripod on three trips, 10 days total, out of the last year and the blue base ring with the degree markers became slightly separated from the main casing (do to stress, I assume, but I only use a D7100 with a mid-range tele-zoom so weight should not have been a problem). During my whole last photo trip, the camera rocked on the tripod and I had a horrible time recomposing to compensate. Plus, I had to shoot on timer to be hands-free. I'm told these Light models had some design problems, which is probably why they no longer sell them. They are instead shipping me an Airhed Switch. We'll see how that goes.